This butternut squash and sweet potato soup was originally posted in September 2015 and has been updated. The weather – who doesn’t love those crisp evenings where you can go for a walk with your bud? The clothes – scarves, tights, knitted sweaters, flannel, tall boots, cute hats, say no more! The food – cinnamon, nutmeg, pumpkin, squash, soups, low-n-slow recipes, comfort food (like this Roasted Acorn Squash Crostini). Yeeees! My oven is put to the test this time of year. No complaints from me! The colours – the burnt orange and red colours of the maple leaves are so pretty. The smells – food and otherwise, like those fall candles. On sale, I recently picked up a bunch of pumpkin-scented ones and they are amazing. Growing up in rural Newfoundland, another scent that resonates strong with me (and brings back wonderful memories) is the smell of wood burning fireplaces, especially on a cool evening. That smell just takes me right back; something about it. And, of course, hubby & I were married during fall, so it holds a special place in my heart. So, yeah, fall is my jam! I’m usually always making some kind of soup, even in the summer, but especially in fall and winter. Typically, I make soup on Sunday and it’s such a regular occurrence that now Sunday in our home is unofficially ‘Soup Sunday’. Soup is tasty, easy to make and a great way to use up things sitting around in your fridge. I’ll usually make a big batch of something to enjoy throughout the week for lunch or supper. This butternut squash soup is always a favourite. It’s unbelievably creamy and super flavourful. Carefully cut butternut squash in half. Scoop out seeds with a spoon. If you like, you can reserve them for later, toss with olive oil and some salt and pepper, roast until crispy and enjoy as a snack. Place squash cut sound down on a parchment lined baking sheet. Bake squash on 400 F for about 40 minutes or until it’s tender when pieced with a knife. Let cool slightly and then scoop out flesh to use in recipe. With this crisp, cool weather it’s the perfect time to be making and eating a nice big ‘ol bowl of this warming butternut squash and sweet potato soup. The finishing touch? Crispy sage leaves. Our garden is overflowing with sage. It’s not one of those herbs we use a lot, but when crisped, it’s magical. I wouldn’t recommend eating raw sage, though. It doesn’t taste great….to me it tastes like pine. Cooked up in a pan with a little oil and then sprinkled with salt? YUM – I could eat ’em like potato chips! This easy crispy sage recipe from Saveur is the one I use. I always use ‘unsalted’ stock in my recipes. I like to do that because I can control the sodium content a little more. If you use a ‘salted’ variety, keep in mind that you may need less salt added. When I originally made this recipe, I used heavy cream instead of whole milk Greek yogurt. The heavy cream works lovely too, but I enjoy the yogurt a little more (plus, it’s lighter). I highly recommend garnishing with crispy sage leave because they’re delish. Speaking of crispy sage leaves, garnish and enjoy as soon as serving. Like with anything crispy, once it hits moisture (aka soup), it will loose it’s crispiness. Hope you love this easy butternut squash soup recipe! Dunk in some crusty bread and have a cup of coffee and you’re set! What’s your favourite thing about Fall? 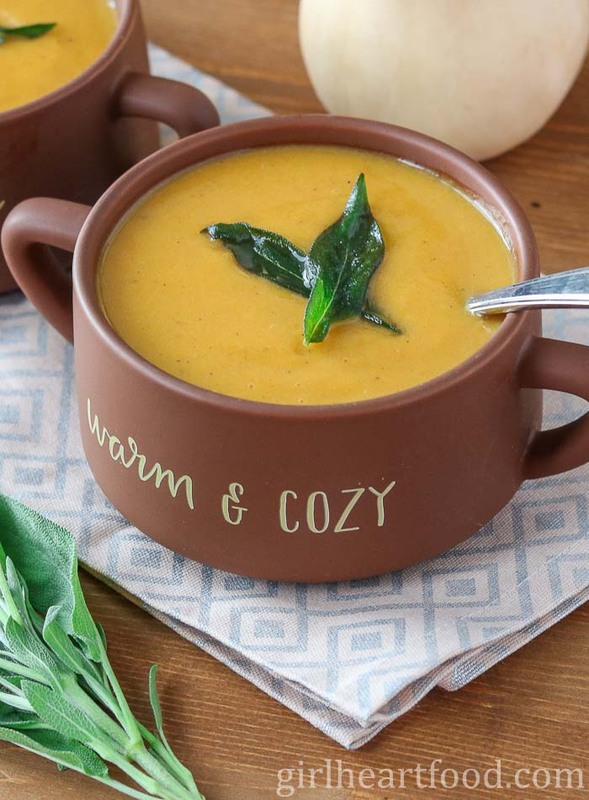 Ultra creamy, warming and comforting this Butternut Squash & Sweet Potato Soup Recipe is sure to be a favourite this fall. It has warming spices like cinnamon, nutmeg and smoked paprika and a touch of sweetness from maple syrup. So delicious! Preheat oven to 400 F and line a baking sheet with parchment paper. Carefully cut butternut squash in half, scoop out seeds and drizzle with 1 tsp of olive oil and sprinkle with 1/4 tsp each of salt and black pepper. Place squash cut side down and bake for about 40 minutes until squash is cooked through when pierced with a knife. Let cool slightly. Scoop out butternut squash. Reserve. In a dutch oven or large pot on medium heat add 1 tbsp of olive oil and cook onion for about 5 minutes. Add garlic to onion and cook 1 minute. Add sweet potato, cinnamon, nutmeg, smoked paprika, remaining 1.25 tsp of salt and 1/4 tsp of black pepper. Stir and cook 1 minute. Next, add veggie stock and reserved cooked butternut squash, bring to a low simmer, cover ajar and cook for 15 minutes until sweet potato is cooked through. Off heat stir in yogurt and maple syrup. With the highest setting on your immersion blend, blend soup until smooth and creamy. Garnish with crispy sage leaves (optional). Enjoy! I always use 'unsalted' stock in my recipes. I like to do that because I can control the sodium content a little more. If you use a 'salted' variety, keep in mind that you may need less salt added. When I originally made this recipe, I used heavy cream instead of whole milk Greek yogurt. The heavy cream works lovely too, but I enjoy the yogurt a little more and it's lighter. I highly recommend garnishing with crispy sage leave because they're delish. Speaking of crispy sage leaves, garnish and enjoy as soon as serving. Like with anything crispy, once it hits moisture (aka soup), it will loose it's crispiness. I really like how you have seasoned your soup, it sounds delicious. Topped with fried sage…yes, please. Thanks so much, Karen 🙂 That fried sage is SO good! That looks like the most velvety smooth, wonderful soup. I’d love a bowl with some crusty bread! Yum, this soup looks amazing! I love making butternut squash soup during the holidays, this will be the perfect starter at a holiday party! Just the name does it for me. The lovely pics make it even tough to wait to try this one soon. Winters here and soup is on my mind. Can’t wait to try this soon. There’s so much to love about this recipe! I’m a huge fan of smokey flavors so that smoked paprika makes me so happy! Plus, I love that you used butternut squash AND sweet potatoes – yum! I’ve never made butternut squash soup by roasting it first. I imagine that adds a lot of flavor to the finished dish! Love the combo amd the color of the soup. Perfect for the weather here. 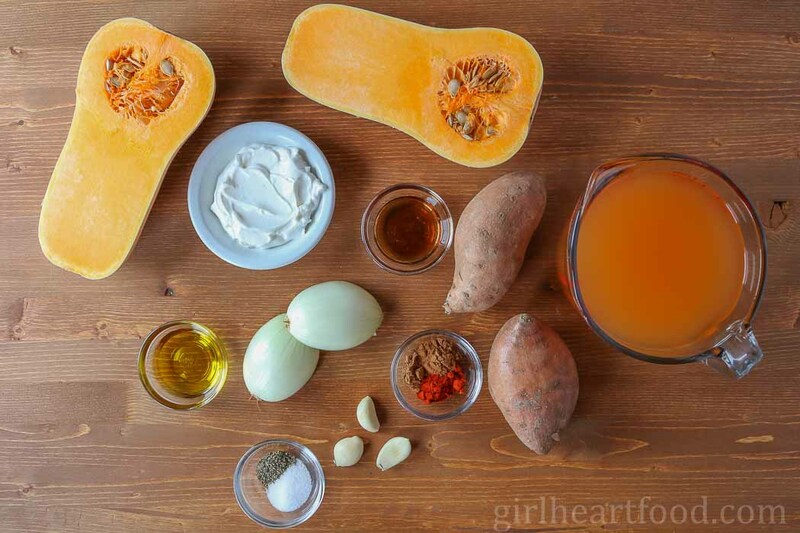 I love squash soup, Never added sweet potatoes, though… great idea! And I’ll have to try crisping sage leaves… what a lovely garnish. I make a similar soup all the time this time of the year! Love that you added maple syrup, can’t wait to give your version a try! Oooo this looks so cozy! The weather’s finally cooled down here in MA, so I can’t wait to dive headfirst into soup season with this! It’s gotten so chilly this morning all of the sudden and I’d love a bowl of this comforting soup right now Dawn!! Looks so delicious and cozy!! Yes! This is exactly what I need right now with this cold… I love the combination of herbs in your delicious recipe. Thanks so much for sharing! Great recipe for those chilly fall days & the perfect combo of all the autumn flavors. Can’t wait to give your version a try! Totally! Thanks Kevin 🙂 Enjoy! One of my favourite things about autumn is definitely comforted food – lots of it 🙂 Your soup looks so creamy & delicious and what a great idea to top it with crispy sage leaves. I have some in my herb garden too so I need to give this one a try! Have a great weekend, Dawn! Same here! Hope you love this one, Miriam 🙂 Those crispy sage leaves are so good! Have a lovely weekend too! It’s getting so chilly here and this is exactly the kind of soup I’m craving! I love how sweet potato gives soup that velvety texture. So delicious, Dawn! Thank you Marissa! This soup will keep ya warm 😉 Have a great weekend! Yum! I’ve been looking for a good butternut squash soup now that it is October and now I have found it! I love how you use Greek yogurt instead of cream in this recipe! Thank you so much for sharing! Have a wonderful weekend Dawn! Thank you Kendra 🙂 Hope you love it! Have a great weekend too! This looks SO GOOD! I just walked Cookie and it was a little chilly (for Phoenix) so I think I need a big bowl of this to warm up. You can’t go wrong with soup in the fall! Have a great weekend, Dawn! You cannot go wrong with roasted butternut squash and crispy sage! I hear you – I could totally enjoy crispy sage as chips too, just never dedicated myself to producing a large enough batch, lol. Something to try, right? I love adding plain yogurt to a variety of soups and dishes – from moussaka to potatoes au gratin and totally stand in favor of this soup made with yogurt! Pinned. I love the spices and maple syrup for sweetness in this soup Dawn! I’d love to cozy up to a bowl this weekend! Chilly weather heading our way! Pinned and can’t wait to try! Thanks so much, Mary Ann! This soup will surely warm ya up 😉 Have a wonderful weekend! Fall is my favourite time of year too! I feel like we actually have a fall season in Newfoundland (compared to spring, which is more like a mild winter!). The colours are just stunning and our fall produce is delicious. All of that puts me in the mood to spend all of my time cooking and baking in the kitchen! This soup looks so cozy Dawn. Love butternut squash soups! Perfect for fall. True! So true! Thanks Leanne! It’s a favourite for sure 🙂 Have a great long weekend! Oh Dawn – what a delightful combination of spices you have in this creamy bowls! That cinnamon, nutmeg and smoked paprika with maple syrup and butternut squash/sweet potato sounds intoxicatingly glorious! So glad you reposted this one as I missed it the first time – also, love your pictures! Butternut soup is in regular Fall rotation here, so can’t wait to try this one! This is a no-brainer win for us! I love roasted butternut squash, especially in soup!! It’s SO very fall! I love that you were married in the fall, it’s such a beautiful time of year. Usually. Right now if you were to look out my window you’d be convinced it’s January!! I need all the soup! I love the Fall season too – food, clothes, all that stuff! I hope you like it, Karrie :)!